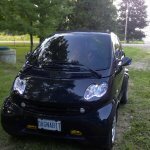 Back when we first got our smart cars we would go to the car show held on Wortley Rd. every Tuesday night. Of course we often enjoyed a pint at the roadhouse afterwards. So for old times sake we will have our supper meet at the Roadhouse. The earlier everybody signs up, the easier it is to make a final reservation. Please don’t wait until the last day to sign up. It’s not a crime if you can’t make it. It’s easier to reduce the total # for a reservation than to increase # at the last minute. It’s better to have an empty chair or two than scrambling to find space for everyone. Please be kind to the old guys that set up these monthly outings. The earlier you sign up, the better. Edited April 3 by Wild!